If your quest for the perfect job with the perfect company has you immobilized, then maybe you should look at your quest differently. We’ve been holding on to the idea that we should find a job we love so it doesn’t feel like work. But what if that logic is all wrong? You won’t have the same job or career forever. In fact, you won’t even work for the same company for your entire life. So why do we hold onto this? Security. Human crave security. But working for a company doesn’t provide that security like it used to. The only security you have now is in knowing that your skills and experience can transfer to another company. You own your career, no one else does. At the end of the day, a job is about paying your bills. We all have them. It is a bitter pill to swallow, but it’s life. So, in order to pay the bills, what type of work would you do? There’s the curse of knowledge, in other words, we only know what we know. There are an infinite number of career options out there today and new ones are popping up every day. But since you have a lifetime to explore, start with the jobs you know about. Work hard. Do your job better than anyone. Be a team player. You know, all the regular career advice applies. At the end of a day, you should be tired- mentally and physically tired (at least in the beginning). Arrive early and leave late. I know some of you will think, “heck, I’m not willing to do this.” But you know what, early in your new career, you have to prove yourself. Proof comes in the form of doing your job well, going above and beyond and immersing yourself in your work to learn everything you can. If you aren’t willing to do this, then I fear, we are all in deep trouble. Once you’ve mastered your role and proven you’ve got what it takes to be the best, you should understand how the business works. How does your role impact the bottom line? What is your value and how can you make a difference to the department and overall business. Who are your competitors and what are they doing that is innovative or different? What strategies are other companies using to grow? This is also a good time to branch out and learn about other functions in the company. Network internally and meet people who are doing things that sound interesting to you. Learn! As you expose yourself to new skills and people, you will absolutely become interested in other things. Follow your instincts. Your career will move in unpredictable new directions. They key to being successful (personally and professionally) is to be able to package your skills and experience in a marketable way. In other words, you must be able to provide proof that your qualifications match your next move. Changing industries or changing careers requires you connect the dots between what the company needs and what you bring to the table. Your passion, excitement, or dare we call it love, comes from the magic that happens when you pair your interests and skills with a job you enjoy and excel at. When you are truly excited about the work that you are doing, there is no stopping you. 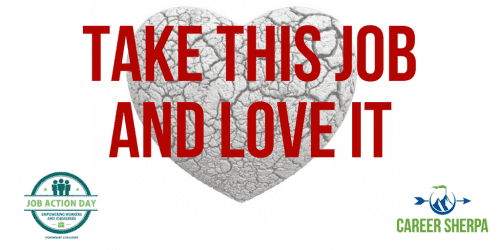 While you may not LOVE every part of your job, you may love some parts of it. Maybe you love the people you work with or one small special project you worked on. Use that feeling to help you find similar opportunities. Do you like the people you work with? Who are they? Where are they from? What are their interests or priorities? If you can answer some of these, then you can find those people in other companies. See where past employees have gone. Ask where your co-workers friends work and find out if the work environment is similar. Mike Rowe, of Dirty Jobs, spoke about the dirty little lie of following your passion in this video for PragerU. I have a hunch this video has an ulterior motive- to drive people into the trades. (Which, by the way, is an excellent thought!) The trades can’t be outsourced! The trades offer great career opportunities! There is no magic wand here. You can uncover and discover opportunities in a variety of different ways. Networking, as much as you despise the idea, is a great way to discover opportunities, especially since the majority of smaller companies don’t like to post jobs and because employers prefer to hire referred candidates. You can uncover opportunities by looking at Indeed, your college career center, Career One-Stop, or even from reading the news. FastCompany, Money, and many other publications are filled with articles on new careers, skills-in-demand and up-and-coming businesses. The Muse delivers articles to help with your job search and also features exciting companies who are hiring. Expect employers to provide more and better information about themselves and their jobs over the next few years, as they struggle to recruit talent. One last piece of advice. Your parents want what is best for you, but they just don’t understand. They were raised in a different economy and have a different mindset. Ignore their career advice. If they haven’t looked for a job in awhile, they are truly out of touch. And if you are older, you may still be listening to your parents’ “words of wisdom.” Ignore that too! We often let those voices determine our career choices or mold our expectations about what we should be doing. Stop that. If you are honest with yourself, you know what you want to do at this point in your life. Why are you still ignoring that? 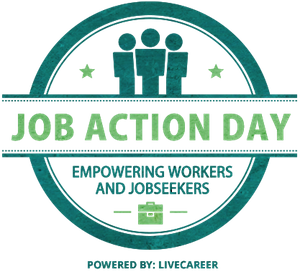 This post is in support of Job Action Day 2016 hosted by LiveCareer.